Estrella del Mar has been described as the best kept secret on the Pacific! Visitors to our condo love the peace and quiet the resort offers with a beautiful sandy beach stretching for 3.5 miles. The Robert Trent Jones, Jr. designed golf course on property offers a challenge for players of all abilities at an affordable rate. You can also receive excellent instruction for beginners as well as low handicap player trying to improve your game. Our condo is on the second floor(top), overlooks the ocean and a beautiful 'infinity' pool and hot tub. The landscaping is meticulously maintained and the views are unbelievable! As you leave the condo you are just steps from the beach. Go south and you will pass residents casting their rods in hope of bringing home dinner! Up the beach a short distance you won't want to miss a visit to the turtle sanctuary. The volunteers will gladly show you around and may even let you release some turtles into the ocean! Continue your walk and you can end up at La Paloma, our fabulous restaurant at the golf shop. Should you choose to walk south a short distance on the beach you will arrive at the Las Villas Hotel where you will find helpful staff ready to meet your needs, with bars, restaurants, a complete fitness center, and spa treatments including manicures, pedicures, massages and hair appointments! The tennis courts are located here. You can also rent bikes and boogie boards, and make appointments for horseback riding. 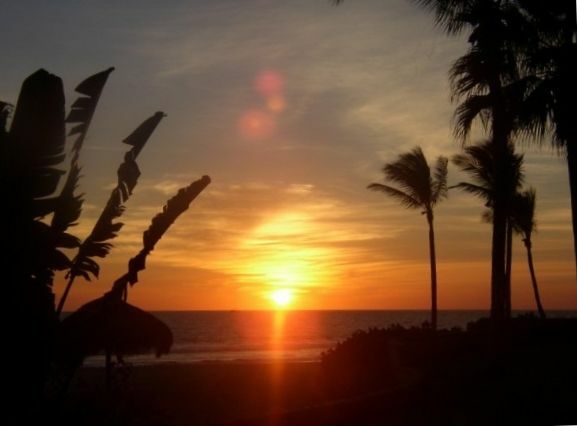 If you want to take a jaunt away from the resort, Mazatlan is just a 30 minute ride via shuttle or taxi. The folks at Las Villas can help you with arrangements. There you will have many shopping options for food, jewelry (silver and opals are favorites), and arts (don't miss the Opera House and many galleries). An October thru January favorite is a trip to the stadium to watch the local team play baseball. They have been in the playoffs often! Mazatlan offers outstanding salt water fishing with an abundance of sailfish. Don't miss the opportunity! Our condo has all the convenience of being home. Two bedrooms (a king bed in the master and a double and twin in the second bedroom). Two bathrooms, a full laundry with washer and dryer, a living room and dining area to entertain new friends you'll meet on the golf course or around the pool. Shuttle Service is available on property. Taxi service is available off property. You will appreciate the most friendly staff you will ever hope encounter. They will help you with any special needs you may come up. The staff is service oriented and you won't have to worry about language barriers. We are happy to visit with you over the phone and suggest an itinerary for first time visitors. Just give us call. We welcome the opportunity to have you as our guest! Beyond our expectations, we loved it! We are nearing the end of a 5 month stay in this condo and it has been a beautiful place to relax and enjoy the sound of the waves gently crashing on the shoreline just outside the window. You can see the Pacific from both glass doorways that open onto a good sized patio where we saw whales and dolphins on multiple occasions. It had a very roomy, home-like and local feel and a well furnished kitchen with a good blender, a juicer, coffee maker and plenty of cookware, good knives and dishes. Did I mention the view...The pool is just downstairs and there are plenty of inflatable tubes to float on. There was never a lack of chairs around the poolside and it never got crowded during our entire stay. We became a part of the community quickly and there are a couple of good places to eat without needing to go into town. The owners were very hospitable and quick to offer suggestions of fun activities and answer any questions we had during our stay. There are people on staff to take care of transportation around the resort and we even had groceries delivered and waiting in the refrigerator when we arrived. The beds are in good condition and there are extra linens and pillows. The light inside is great from sunrise to sundown, and the view is truly amazing. It has a nice private feel on the second floor and the pool is a good distance from the patio. The televisions are good and the master bedroom has a flat-screen as well as the main living room. There are even a few games to play and some movies to watch. Overall we were very pleased with our stay here and hope to find our way back here again. This condo was beyond what we expected and we were very pleased with the owners and the people on staff here. It was our first time renting and we even extended our stay an additional month trying hard as we can to stay just a little bit longer. The place was nice for the family but the condo where I stayed had some issues. Nobody knew who had the key no water or ice on the fridge, ants on the counter top and no content person at all. Employees at estrella del mar were very friendly and helpful. Thank you for reporting back to us. The problem with the key has been communicated to our on-site property manager. The problem with the ants has been remedied. The ice and water dispenser on the refrigerator refrigerator door is scheduled to be repaired. Thanks for reporting it. We spend a truly wonderful vacation. The property and the condo are beautiful, and we couldn't ask for more. We already miss being at Mazatlan! Lovely condo, great beach and pool. Only downside is distance from town. While we truly enjoyed our stay, it would have been helpful to know that if you want to get around the property, visit Mazatlan or Stone Island, and to go get food and basic necessities such as booze, it's advisable to rent a car upon arrival at the airport. After we sated our need for mobility, then we were able to relax, plan itineraries, take spur of the moment excursions, and enjoy the tranquility and ambiance of the resort. We met a lot of great people and were amazed at the service and how well kept the property is. Also advisable to get a translator app on the cell phone as unlike the Cancun or Cabo resorts, not much English spoken. Look forward to the next time. Wonderful stay at Estrella del Mar in July 2017. The unit was perfect and the owner was a pleasure to deal with. It was wonderful drinking coffee in the morning on the balcony watching dolphins swim along the beach while watching my children catch fish in the surf. One small issue arose (weather related, no fault of owners) during our stay but it was quickly handled by the staff. Just a little bit of a advice if you decide to visit. The beach is not suitable for swimming but the beautiful pool more than made up for it. Also, the location is a bit far from the city so make sure you bring groceries if you plan on cooking for yourself as the trip to the market is about 20 minutes. The on-site restaurants were marginal at best so I won't recommend. My children are already making plans for next year at Estrella Del Mar. can't wait to go back myself.